Definition: A special type of PN junction device that generates current when exposed to light is known as Photodiode. It is also known as photodetector or photosensor. It operates in reverse biased mode and converts light energy into electrical energy. It works on the principle of Photoelectric effect. The operating principle of the photodiode is such that when the junction of this two terminal semiconductor device is illuminated then electric current starts flowing through it. Only minority current flows through the device when the certain reverse potential is applied to it. The PN junction of the device placed inside a glass material. This is done to order to allow the light energy to pass through it. As only the junction is exposed to radiation, thus, the other portion of the glass material is painted black or is metallised. The overall unit is of very small dimension nearly about 2.5 mm. It is noteworthy that the current flowing through the device is in micro-ampere and is measured through an ammeter. Photovoltaic mode: It is also known as zero bias mode because no any external reverse potential is provided to the device. However, the flow of minority carrier will take place when the device is exposed to light. Photoconductive mode: When a certain reverse potential is applied to the device then it behaves as a photoconductive device. Here, an increase in depletion width is seen with the corresponding change in reverse voltage. Let us now understand the detailed circuit arrangement and working of the photodiode. In the photodiode, a very small reverse current flows through the device that is termed as dark current. It is called so because this current is totally the result of the flow of minority carriers and is thus flows when the device is not exposed to radiation. The electrons present in the p side and holes present in n side are the minority carriers. When a certain reverse-biased voltage is applied then minority carrier, holes from n-side experiences repulsive force from the positive potential of the battery. Similarly, the electrons present in the p side experiences repulsion from the negative potential of the battery. Due to this movement electron and hole recombine at the junction resultantly generating depletion region at the junction. Due to this movement, a very small reverse current flows through the device known as dark current. The combination of electron and hole at the junction generates neutral atom at the depletion. Due to which any further flow of current is restricted. Now, the junction of the device is illuminated with light. As the light falls on the surface of the junction, then the temperature of the junction gets increased. This causes the electron and hole to get separated from each other. At the two gets separated then electrons from n side gets attracted towards the positive potential of the battery. Similarly, holes present in the p side get attracted to the negative potential of the battery. This movement then generates a high reverse current through the device. With the rise in the light intensity, more charge carriers are generated and flow through the device. Thereby, producing a large electric current through the device. This current is then used to drive other circuits of the system. So, we can say the intensity of light energy is directly proportional to the current through the device. Only positive biased potential can put the device in no current condition in case of the photodiode. Here, the vertical line represents the reverse current flowing through the device and the horizontal line represents the reverse biased potential. The first curve represents the dark current that generates due to minority carriers in the absence of light. As we can see in the above figure that all the curve shows almost equal spacing in between them. 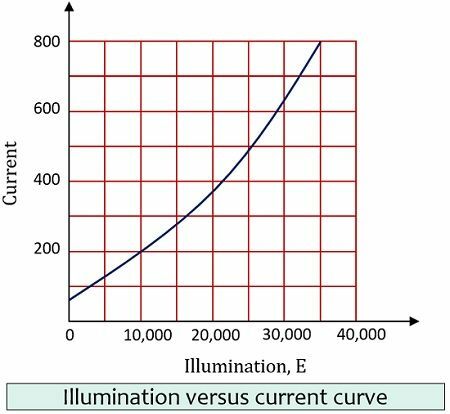 This is so because current proportionally increases with the luminous flux. It is noteworthy here that, the reverse current does not show a significant increase with the increase in the reverse potential. It shows a quick response when exposed to light. 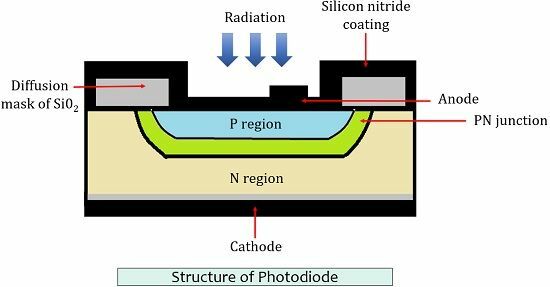 Photodiode offers high operational speed. It provides a linear response. It is a low-cost device. It is a temperature dependent device. And shows poor temperature stability. When low illumination is provided, then amplification is necessary. 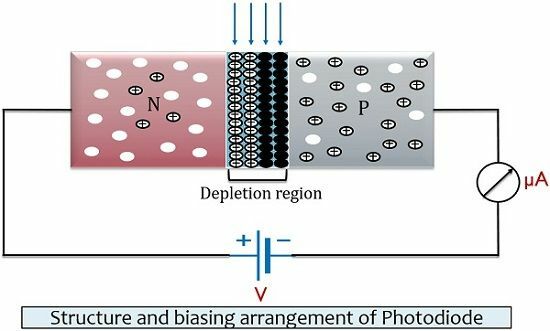 Photodiodes majorly find its use in counters and switching circuits. Photodiodes are extensively used in an optical communication system. Logic circuits and encoders also make use of photodiode. It is widely used in burglar alarm systems. In such alarm systems, until exposure to radiation is not interrupted, the current flows. As the light energy fails to fall on the device, it sounds the alarm. 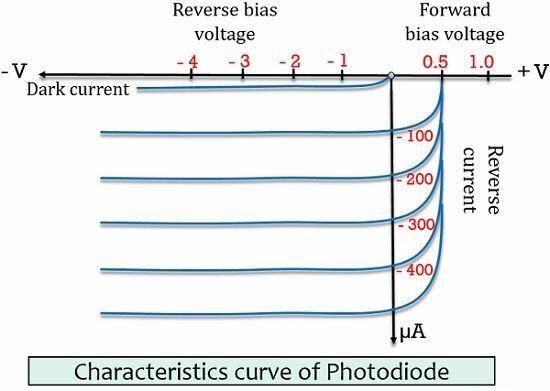 In case of a typical photodiode, the normal reverse current is in tens of microampere range.